The seller is away until Apr 29, 2019. 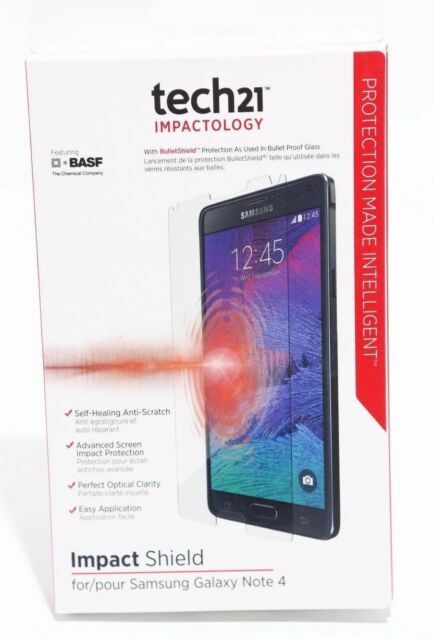 NEW Tech21 Impact Impactology Shield Self Heal for Samsung Galaxy Note 4. ABOUT THIS PRODUCT Our Impact Shield with Self-Heal screen protector for Galaxy Note 4 contains an advanced multi-layer system. If you want a screen protector that scratches easy get this. Self heal and new technology all lies. Great product. Has a wonderful tool for easy and perfect application. Loving it. Great protector and easy to use! Easy to install and the feel and clarity is great. These shields are tricky to apply. I'd suggest a pro.